When it comes to health issues on a dairy farm, lameness is usually a main concern along with mastitis and reproductive issues. Lameness includes any abnormality which causes a cow to change the way she walks. It can be caused by a range of foot and leg conditions including foot rot, digital dermatitis, laminitis, and claw disease. Lameness can be influenced by nutrition, disease, genetic influences, management, and environmental factors. Not only does lameness cause pain and distress for dairy cattle, but it also has a large economic impact on the dairy operation. In the fact sheet Economics of Dairy Cattle Hoof Health, UW-Extension Calumet County Agriculture Agent Eric Ronk focused on the economic costs associated with hoof health. For more information regarding hoof health and/or animal well-being, visit UW-Extension Animal Well-being and Herd Health. 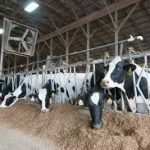 Wisconsin dairy farms have gone through constant change when it comes to handling materials on the farm. Forty to fifty years ago it was the traditional method of the shovel and pitchfork, the arm-strong method, when it came to moving feed and cleaning out barns. Today, farm operators have moved to the tractor and loader. 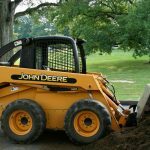 In the factsheet Skid Steer Handling Skills, UW-Extension Eau Claire County Agriculture Agent Mark Hagedorn shares some tips in handling skid steers safely.